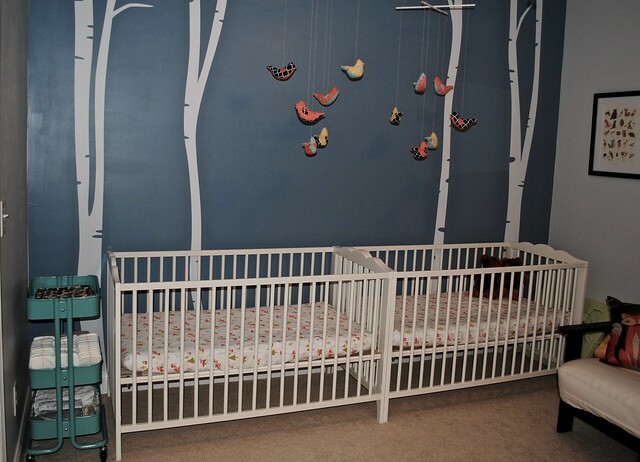 The twins’ nursery is basically done, and not a moment too soon. 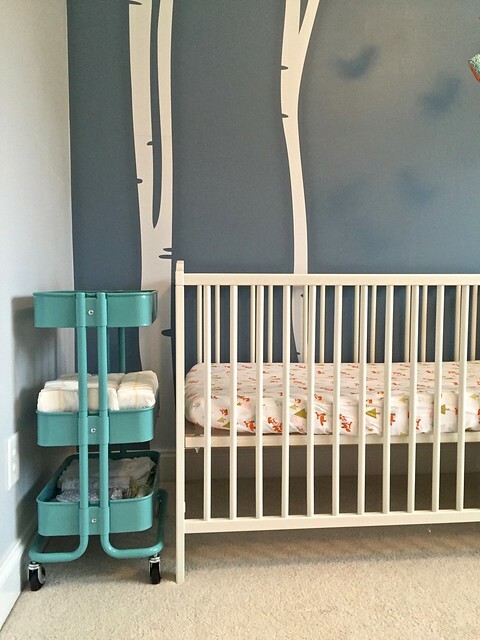 Though they won’t be sleeping in here for a while, instead being in a double bassinet in our bedroom, we wanted it finished before their arrival. 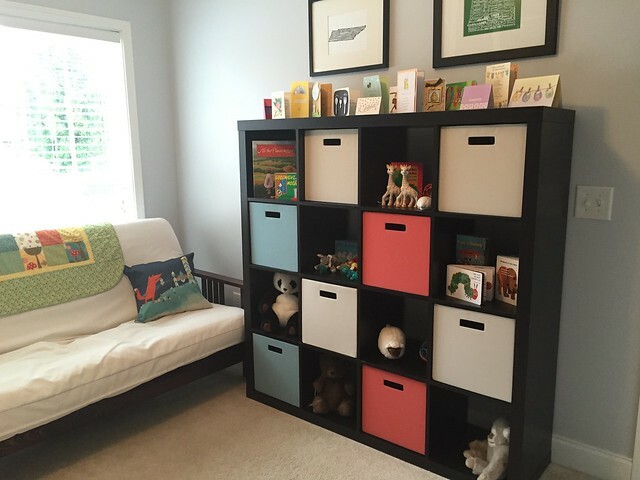 We got the cribs from IKEA (the Hensvik) and the wall decal from Etsy. It was rather a pain to put the decal up, but we were really happy with how it turned out. 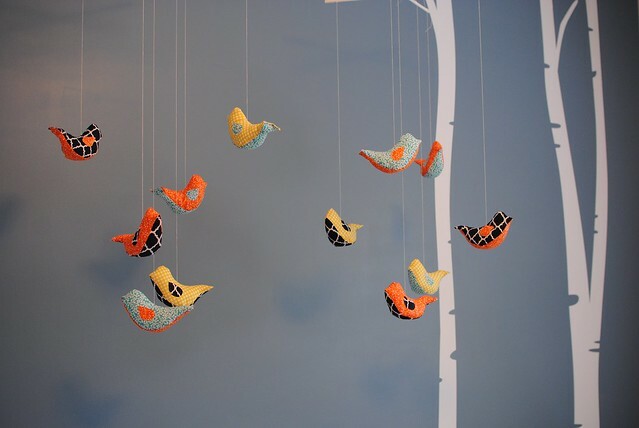 I made the bird mobile using this pattern. I am not much of a sewing person (I don’t have a machine, for example, so I did these by hand), but I think it came out pretty well! My original plan was to use real branches from our woods instead of plain dowels as hangers, but my husband said that real branches would be “creepy” and would scare the babies. I think we all know that by “scare the babies,” he really meant they would freak him out. Heh. So the dowels were a last-minute change. 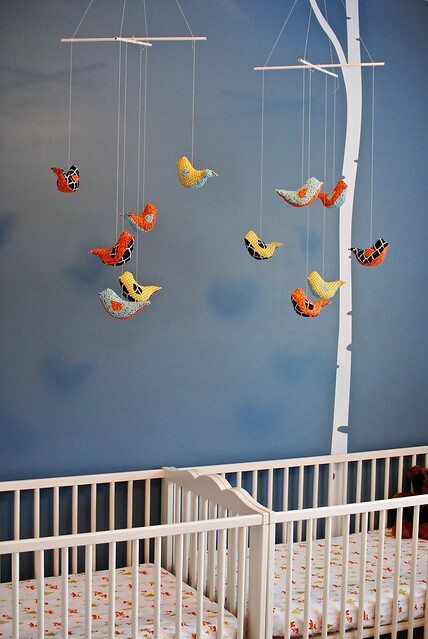 The hardest part of the mobiles was getting them to balance correctly, which they still don’t quite do, but hey, I think they’re fine enough. This little cart is the IKEA Råskog, darling of Pinterest and home decor blogs the world over. It’s not going to live in the nursery, though: it will be our mobile supply cart filled with diapers, wipes, blankets, burp rags, pacis, and nursing/pumping/bottle supplies. It’ll probably be in our bedroom for the first little while and then it can roll around to wherever it is needed. So happy with this idea! Here we re-purposed some furniture from our old house. CW’s grad-school-era futon is being reincarnated with a new cover and pillows as a feeding/napping spot. We didn’t go with a glider because I wanted something wide enough to hold two babies at a time and to be able to set one baby down in a boppy pillow beside me if needed. If at some point we decide we need a glider, we can revise (though there isn’t much room in here; we’ll see I guess). The big IKEA shelf (formerly the Expedit, now known as the Kallax) used to be storage/display for my typewriters and other curios, but now it is doing business as an all-purpose storage for clothes, blankets, books, and toys. I got color coded bins for boy and girl clothes and the white bins are for unisex/matching clothes and other miscellaneous items like blankets, wraps, carriers, etc. So. No glider, no dresser. Hopefully we’re not nuts. Up top I have my state map art (Tennessee, my home state, and Oregon, the home-of-my-heart where I lived for 7 years) and we will be adding an Iowa print to represent CW’s side of the family. 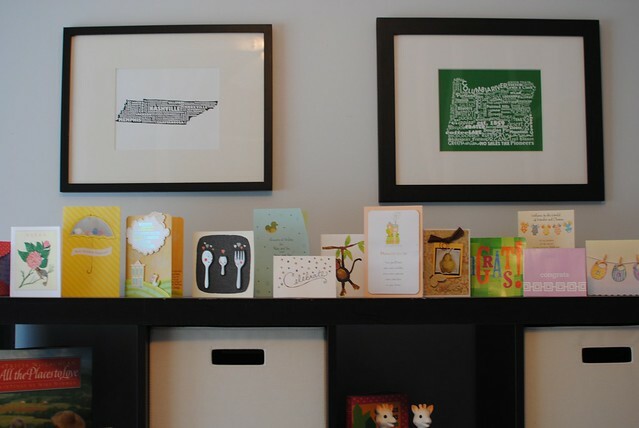 The cards are from our friends and family and will eventually be moved, but I like them there for now. 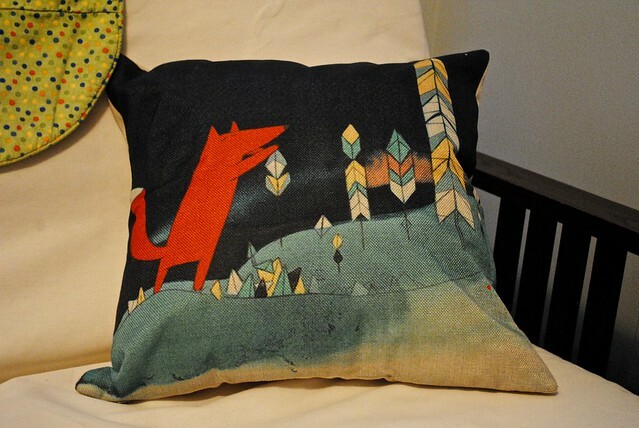 Throw pillows on the couch. I bought these pillow covers from Amazon and I love them. 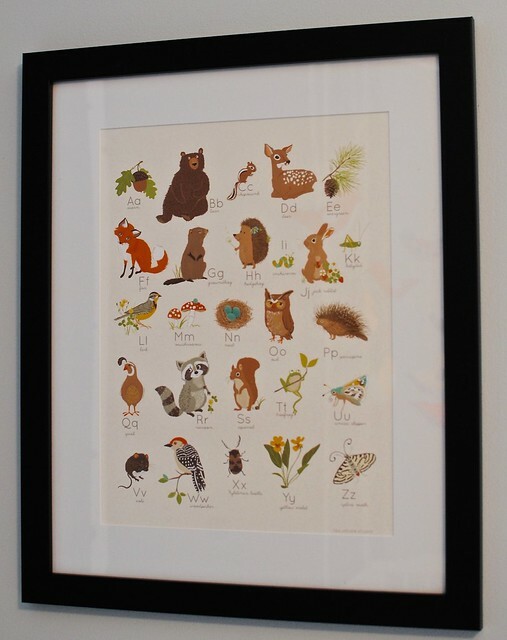 This alphabet print was a baby-shower gift from our good friend B., and it is one of my favorite things. I just love the illustrations so much. 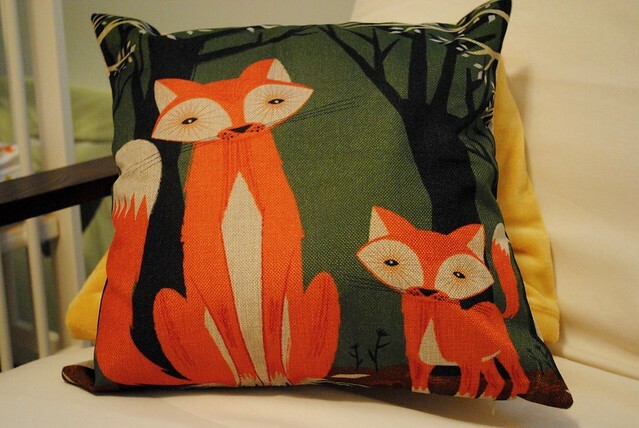 CW hates the fact that there is a vole and a squirrel on it but I think he will survive. 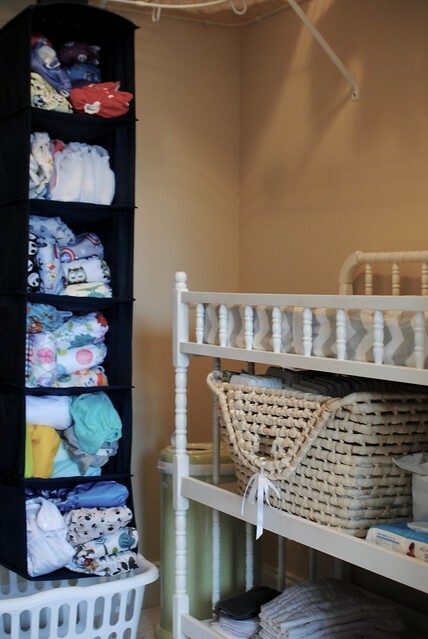 Here’s a peek into the not-so-glamorous closet, where we have the diaper station. The changing table was a family hand-me-down and I’m using a basic closet “sweater organizer” thing for cloth diapers. Disposable diapers for the early days are in the woven basket (a gift). You can see our ridiculous fancy diaper pail in the back corner, which CW thought was worth the investment. I hope so! Finally, a little bit of fun on the wall. 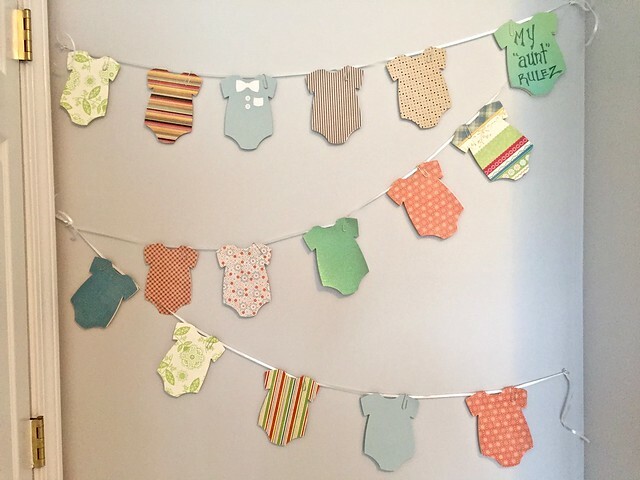 Our friends wrote these notes inside the onesie-shaped cards at our baby shower. They have words of wisdom and advice and sweet messages, so I made them part of the room. And that’s that! Babies, don’t think you can show up now just because your room is ready. You still have to wait a little while longer.